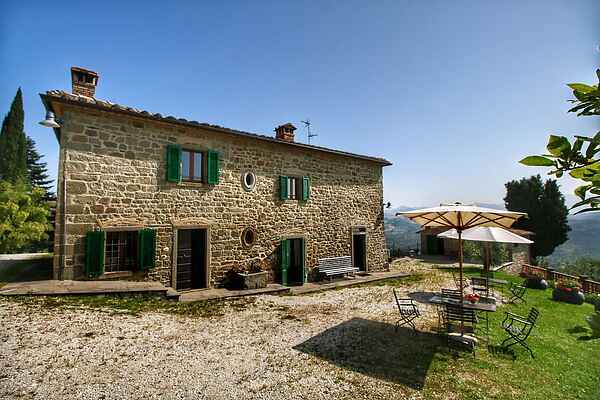 Charming house in a nice location in the Apennine foothills. You have a beautiful view from the estate. You enter the estate's old defense tower from the patio in front of the house. You'll notice the striking elements immediately. The large open fireplace and old beams in the ceiling, the terracotta floors and traditional furnishings will take you back in time. You can sit in front of the house or find a spot somewhere else on the estate or by the pool. The great art cities of Tuscany, Florence, Arezzo and Siena and in Umbria, Gubbio, Assisi and Perugia can be visited in a day from Terra di Michelangelo. From the estate, you can easily visit and enjoy the small villages and towns scattered on the hill tops. Each village has its own charm and history. The great art cities of Tuscany, Florence, Arezzo and Siena and in Umbria, Gubbio, Assisi and Perugia can be visited in one day by Terra di Michelangelo.besichtigt werden.